Are you intuitive? Do you trust your intuitions? 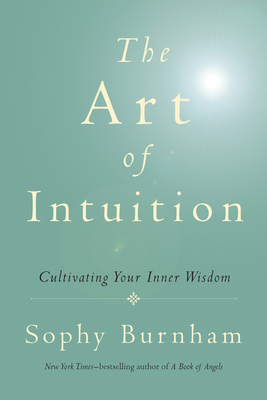 In The Art of Intuition, Sophy Burnham contends that we all have hunches and sudden insights and that we need only awaken to our inborn abilities in order to develop our inner wisdom. In this fascinating book, Burnham tells the stories of individuals who have "seen without seeing," illustrating the wondrous workings of what she calls our "intuitive hearts." Exploring a wide range of subjects-from loved ones'' abilities to communicate telepathically to the mystery of the artist''s inspired creativity; from animal communication to psychic powers; from scientifi c studies of premonition to the skeptics who deny the very existence of such phenomena-this is a stunning contribution from a leading spiritual thinker on a topic vital to us all. With exercises and step-by-step instructions, this inspiring book guides readers in developing their intuitive powers and learning to trust their gained insights. According to Burnham, intuition is always right, and when you receive messages from Spirit-be it in the form of a subtle impression or a thunderous bolt from the blue-you must always, always act on them. In this fascinating book, Burnham tells the stories of individuals who have "seen without seeing" to illustrate the workings of what she calls our "intuitive hearts." Exploring such topics as how loved ones are able to communicate with one another telepathically to skeptics who deny their power to see into the future, this book represents an important spiritual thinker's take on a subject that is vital to us all. According to Burnham, intuition is always right, and when you receive messages from Spirit-be it in the form of a subtle impression or a thunderous bolt from the blue-you must always, always follow the call. Sometimes it comes as the subtle nudge -- go here, not there. Other times it hits like the bolt from the blue. Still other times it's the solution that drifts to us mysteriously in a dream, or when we're meditating or taking a walk -- when our mind has left the problem behind. "Remember that name," it said. "It will be yours!" As we grow older, we learn to discern and trust this mysterious force of intuition, perhaps in part because we have more time for the luxury of inward exploration. Or perhaps it is because we've learned to accept this gift that comes with spiritual development. I was talking recently to an older gentleman, who is careful to operate only from his own intuition. "I used to make all my decisions by intellect," he said, "and my life was a mess! Finally I went to a therapist who taught me to trust my intuition. I won't make any decision now unless I get an inner nudge." Scientists tell us we use only a fraction of our brain cells. Do those sleeping ones hold the gifts of prophecy and intuition, of telepathy, creative inspiration and other psychic aptitudes? I believe they do. Accessing these abilities is like tuning to a radio frequency. As you raise your vibration by compassion and purity of heart, you become more sensitive, and you hear without the static of your surroundings or the chatter of your own racketing monkey-mind. Several things inhibit intuition: First is mistrust. We negate our insight by thinking too much. Ignorance can also block it, for we don't always recognize the signals when they come. Addictions to drugs, alcohol and mind-bending influences leave us baffled and disoriented. Over-medication can also distort the pure alchemy of our minds. Lastly, stress, anxiety and fear can cloud our inner wisdom. What encourages intuition? I think it is simply stillness. The most important quality is the ability to be comfortable in your own skin and to listen, really listen, for the nudge of insight that is by nature yours. I believe that we are all expressions of the Divine. The very cells of our bodies are composed of stardust. We are spiritual entities enclosed in skin, but our minds can roam the farthest reaches of the earth, unhindered by space or time. As we grow older, we learn to let go of the need to control. We listen more quietly. We trust silence. We learn to act on intuition, our inner wisdom, for these are designations of our own divinity. "Intuition is not reached through the conscious or thinking mind, which locks onto intellect, logic, and analysis. It is seen with the inarticulate dream-mind, the subconscious or unconscious. Please note, I'm using the words not in the classical model of ego, id, and superego as defined by Sigmund Freud but in the loose sense of the artist's inventive mind: that part of the brain that we use when daydreaming, or sleeping, or weeding the garden mindlessly, or meditating, or absorbed in creating a painting, music, or other work of art. "For intuition, you need the simplicity of the child-mind, the dreaming mind that tosses out images and information when you are asleep. I think it's important to encourage your children, therefore, to daydream, space out, go woolgathering. We don't need to fill every moment of their days with activities. Let them learn to be alone, and the same holds true for adults too. "You need to be comfortable with silence and solitude. Learn to be quiet. Turn off the TV. Shut down the computer and video games. Befriend yourself. 'Go watch the grass grow,' as my mother used to say. 'Do nothing.' And you'll be amazed how much is revealed to you by merely opening yourself to your environment, observing with attention and without judgment. "Allow yourself to dream. Your Higher Consciousness will point out where you ought to go." To order The Art of Intuition from Amazon.com, click here!